Stay on the front foot. Exclusive to the Crafter range, this potentially life-saving system continually evaluates steering movements and other independent signals, and if fatigue is detected, warns the driver with an alarm, and recommends the driver take a break on the Multi-Function display. This intelligent feature allows you to make a hill start without the vehicle rolling back. 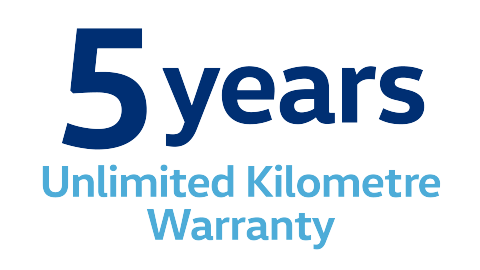 If you’re on an incline greater than 5 per cent, the system will hold your car stationary for 1.5 seconds after the foot braking is released by temporarily locking the braking pressure. The Crafter Cab Chassis now features front side and curtain airbags for the driver and front passenger, giving you the optimal protection in the event of head-on or side impacts. The optional Adaptive Cruise Control (ACC) system lets you set the speed you want to travel and the gap you want to allow between you and the car in front. Using a radar sensor, the car then maintains your speed and your distance. In doing so it makes life easier for the driver, particularly on long journeys, and reduces the risk of exceeding the speed limit. Forms part of the optional Driver Assistance Package 'Chassis'. 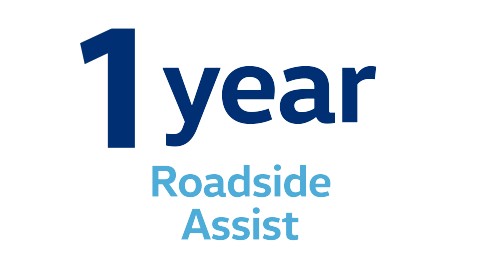 Using a camera to monitor the markings on the road ahead, the optional Lane Assist helps keep you safe by working to prevent you leaving your lane unintentionally. If you start to leave your lane without indicating the system takes corrective steering action. If you still don’t respond a message will appear in the Multi-Function Display in conjunction with a warning tone. Forms part of the optional Driver Assistance Package 'Chassis'. 8" colour touchscreen display with proximity sensor, AM/FM radio, CD player (MP3/WMA compatible), 2 x SD card slots, AUX-IN input and four speakers. 3. The Start/Stop system is designed to reduce fuel consumption and CO2 emissions. It achieves this by automatically switching off the engine while the vehicle is stationary and then starting it again automatically when the driver wants to drive off. There are certain operating conditions where the Start/Stop system is deactivated (e.g. during engine warm-up), please refer to the owner’s manual for full operating information. 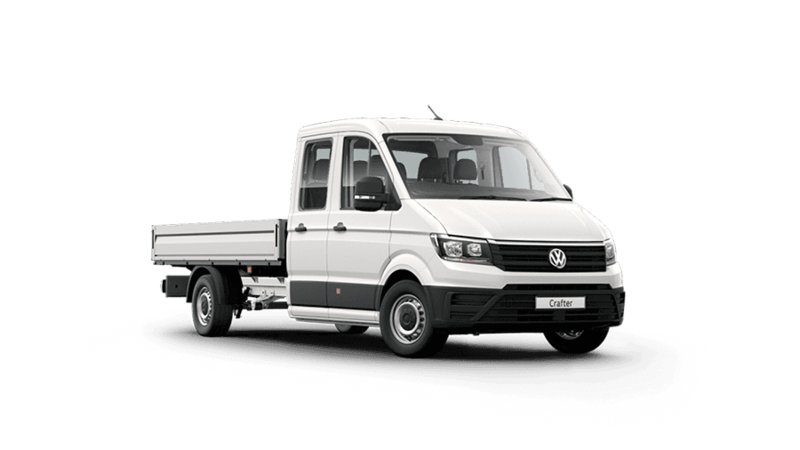 For the first time ever, the Crafter Cab Chassis is available with the 8-speed automatic gearbox with a torque converter in front wheel drive. Every business has its own unique set of needs from a commercial vehicle. That’s why the Crafter Cab Chassis is purpose-built to be customised, to help meet even the most demanding requirements. The possibilities are endless. The Crafter Cab Chassis’ ergonomic cabin has space for three in the single cab, and seven in the dual cab. Driver comfort is the focus, with a newly designed driver seat featuring longitudinal and height adjustment, electrical 4-way adjustable lumbar support, adjustable backrest and seat cushion angle, and two adjustable armrests. All of this is paired with generous storage throughout to make your working day easier. The Crafter Cab Chassis long wheelbase (4,490 mm) has a total vehicle length of 6,836 mm. Prepared for almost every challenge. The Crafter Cab Chassis is available with an optional folding dropside aluminum tray - direct from the factory. 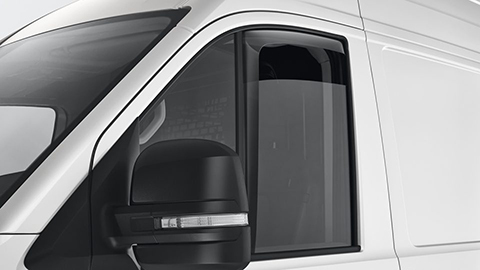 With a robust load surface, rear step built into the tailboard and safety latches, it makes the Crafter Cab perfect for any number of tough jobs. Don’t let rain stop you from putting your window down. 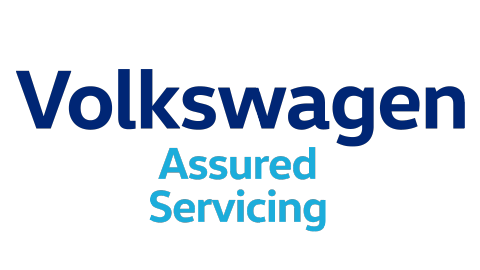 Volkswagen genuine low profile slim line weathershields allow you to enjoy the benefits of fresh air whilst protecting you from the elements. Made from durable UV tolerant acrylics. 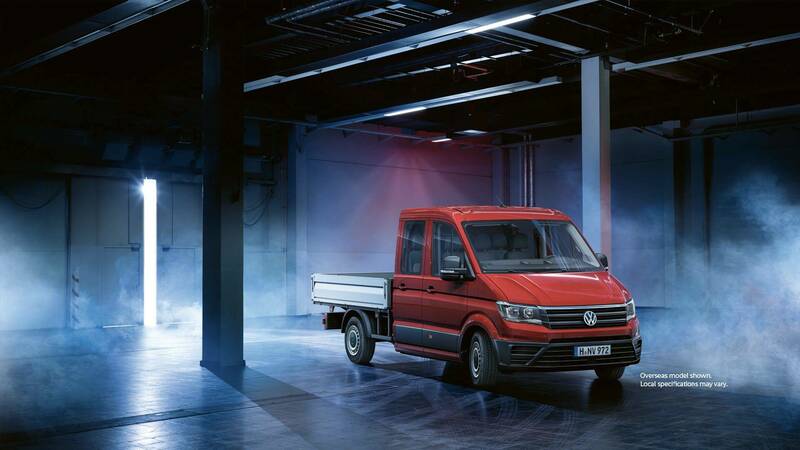 Take a closer look at the information for the Volkswagen Crafter Cab Chassis.